Vibrant, dynamic and sprawling, navigating the city with ease with a rent a car in Los Angeles from Sixt. With new cars on average 3 months old, you'll find the right vehicle for your trip, whether you need an economy car, minivan, convertible or SUV. We offer several convenient locations where you can arrange a top-quality car rental in Los Angeles. Driving is an integral part of California city life and also affords you the luxury of designing your own itinerary. While the "City of Angels" is famous for being a leader in the entertainment industry, it is also a hub for artists, technology companies, business, and of course a great place to take a vacation. 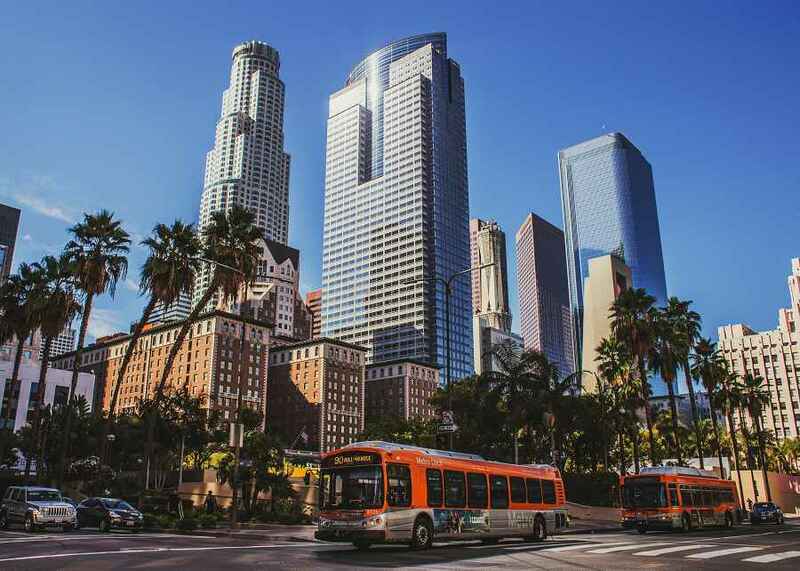 Our Los Angeles branches are spread throughout the city with one directly at LAX, and other branches situated in popular neighborhoods such as Beverly Hills, Venice Beach, and Downtown LA in the Financial district close. Whether you are looking for a luxury sports car or an economic compact vehicle, we have something that will suit all your travel needs. We also offer various extras to help you have an optimal driving experience, such as an additional driver, GPS, and child seats. Choose a compact car or sedan for a practical vehicle for driving in the city. Those with more gear or more passengers can travel comfortably in a minivan or full-size SUV. If you are coming to LA for a fun weekend away treat yourself to a top of the line vehicle like a Mercedes-Benz or BMW. You can also book a convertible rental perfect for cruising down the wide roads and highways of sunny Southern California. Driving is a major part of the Los Angeles experience. The city is rather spread out so having a car rental in Los Angeles is the ideal way to get around. As you make your way to all the fabulous attractions be prepared to encounter the famous traffic of LA freeways. We recommend including a GPS to your rental vehicle so you can make your way around using backstreets if necessary. It is also important to know that speed is monitored by red light cameras and a photo of your license plate number will be taken to fine you for speeding. When you rent a car in Los Angeles it is a good idea to familiarize yourself with the main freeways. The famous 405, often referred to as Santa Monica Freeway, is known for its scenic views. Running through the greater Los Angeles area the 405 runs along the Pacific Coast and connects to the Ventura Freeway, also known as Route 101 or I-10. This major freeway also offers access to Culver City, Westfield Mall, and more. These routes do tend to suffer from congestion, so another option is to drive I-5 which runs directly through Downtown LA. Summer is the ideal time to visit Los Angeles, and you might be surprised to know that temperatures are, on average, in the mid-70s. There are tons of things to do here to enjoy the nice weather, like go to Venice Beach or the Santa Monica Pier, or take in a Dodgers baseball game. Head to Disneyland or Universal Studios Hollywood but know that the summer is the most popular time to visit and there will be long lines. There are quite a few opportunities for hiking in or near the city, including Topanga State Park or Griffith Park. There are lots of free concerts here in the summer, or you can catch a performance at the outdoor ampitheatre the Hollywood Bowl. If you want to watch a movie al fresco, there are free showings from June through August on Long Beach. For a little day trip from the city, you can take a ferry to Catalina Island for a bit of peace and quiet. Besides attractions relating to the film industry like the star-studded Hollywood Boulevard or Universal Studios, Los Angeles is home to an impressive selection of museums. The city actually has more art centers per capita than any other city in the world, totaling 841. Stop by the fantastic Los Angeles County Museum of Art or the Getty Center, one of the most visited museums in the country thanks to its unique design and location on the hills looking over the city. Santa Monica Pier is a must visit with its iconic entrance as well as family attractions such as the solar-powered Ferris wheel, aquarium, the original 1920s carousel and much more. Other unmissable seafront attractions and beaches are Venice Beach, Manhattan Beach, and Redondo Beach.